Do You Have a Pressure Hose That Gets Entangled Around Your Equipment? The solution is pressure washer hose reels! Pressure washer hose reels not only make hoses last longer, they save time and frustration. 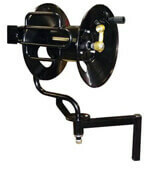 Trailer mounted reels pivot and point to where you need the hose. Wall mounted ones save much needed space on the ground. Hand Carry models are light, yet durable to withstand the heavy duty workload. All our models are weather resistant due to the durable, powder-coat paint that creates a hard, smooth finish that stays attractive for years. 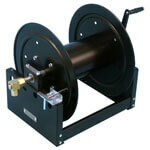 The constant tension design keeps the reel from unspooling additional hose. The high-strength, free spinning and full-palm handle rides on a solid steel shaft. The UltraLife Swivel has a revolutionary design that is unlike anything else in the industry ! 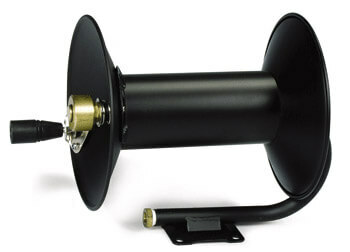 The included 3/8" stainless and machined brass swivel stands up to spiked pressure loads and harsh chemicals. This swivel is also protected from hard pulls with the Loop-'n-Clamp Design, an innovative method of hose attachment that extends its life. The 3/8" inlet hose features two-wire braid reinforcements and a 3/8" NPT rigid male fitting. Hose NOT INCLUDED on any of the pressure washer hose reels. 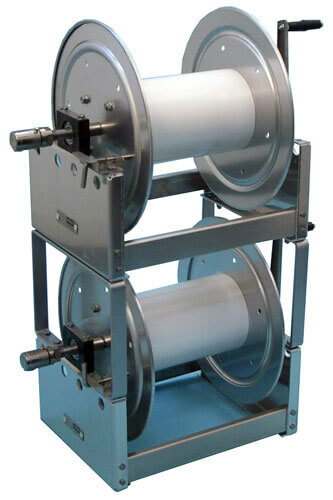 Reels are suitable for Air, Water, Oil applications. 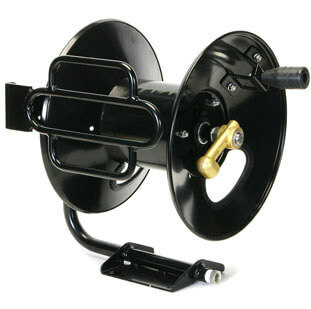 Hose reel will hold 50 ft or 100 ft of 3/8” hose. These reels are rated up to 3500 PSI. It is not recommended to attach a reel to any machine weighing less than two hundred pounds. Hose reel will hold 50 ft or 100 ft of 3/8” hose. 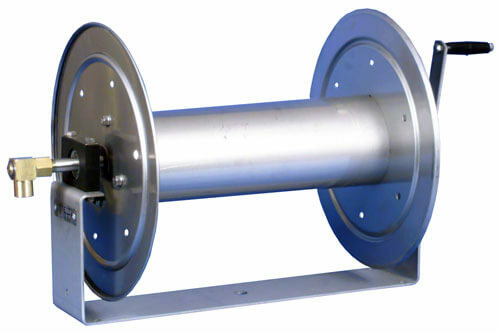 These reels are rated up to 4000 PSI. It is not recommended to attach a reel to any machine weighing less than two hundred pounds. 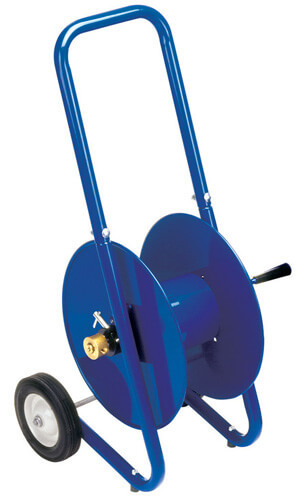 Easy to use and extremely durable, these steel hose reels are the perfect storage solution for any serious application. 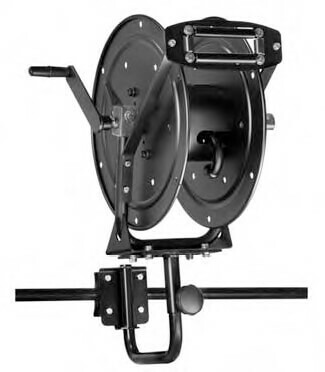 A fixed base, mechanical break, and heavy-duty locking mechanism ensure that the reel can stand up to even the harshest working conditions, while features like a flip-over hose guide and an oversized drum make it adaptable to nearly any job. A pivoting hose reel is the perfect combination of toughness and flexibility. 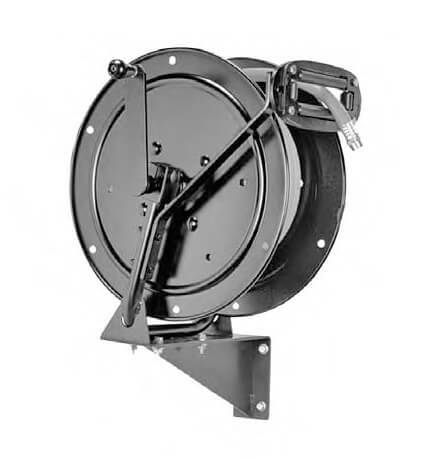 Steel construction and oversized locks make these reels extremely durable, while its 360° locking rotation, extended swivel, and flip-over hose guide allow it to easily supply hose from any angle. This reel also features an oversized drum that can easily fit the advertised length of hose with room to spare. 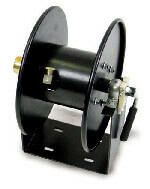 Length - 100' x 3/8"
The sturdy "U" shaped frame and all steel construction make this one tough little reel. Hose capacity ranges from 50 to 550 ft of 3/8" hose, 1/2" hose or 3/4" hose depending on model. All listed models are supplied less hose. 6" 13" 12" 4-1/2" 5-1/2" 3" 4"
4 18-1/4" 9-1/2" 18" 17" 8" 5-1/2" 3" 5-1/2"
5 22-3/4" 14" 18" 17" 12-1/2" 5-1/2" 3" 10"
6 28-1/4" 9-1/2" 18" 17" 8" 5-1/2" 3" 5-1/2"
7 23-1/4" 14" 18" 17" 12-1/2" 5-1/2" 3"
It is lightweight, compact and versatile with working pressure up to 4000 PSI. The hose control bar is easy to grab and go and prevents the hose from slipping off the discs. Hose capacity ranges from 100 to 315 ft of 3/8" hose. Hose control prevents hose from slipping off the discs. 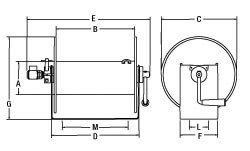 Hose reel will hold 50, 100, 150 or 200 Feet of 3/8” hose. Includes handy carry frame with rubber shock isolating feet. Comes with 3/8 inch quick-connects. 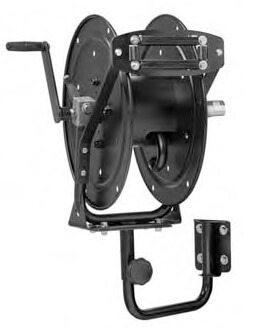 The sturdy "U" shaped frame and all steel construction makes this one tough little reel. Hose capacity ranges from 42-625 ft of 1/4", 3/8" hose, 1/2" hose, 3/4" or 1” hose depending on model. All listed models are supplied less hose. Available as Aluminum or Stainless Steel. The full frame construction makes this one tough little reel. Hose capacity ranges from 42-625 ft of 1/4", 3/8" hose, 1/2" hose, 3/4" or 1" hose depending on model. All listed models are supplied less hose. Available as Aluminum or Stainless Steel. These reels are stackable. These full frame reels feature a black powder coated finish on a full frame. Frames can be stacked for multiple reel options. Both models come with a pin lock mechanism and self aligning bearings. Lightweight and easy to handle. Good chemical and abrasion resistance. 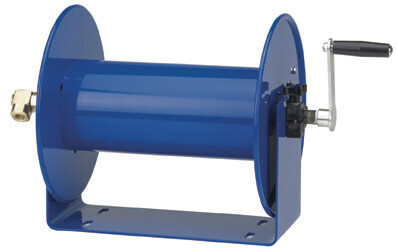 Available in lengths of 50' to 300' and 4400 PSI to 4800 PSI ratings. Features and uses of high pressure hose reels. Ultimate Washer® is a Registered Trademark of the Ultimate Washer, Inc Company. All rights reserved.